A basic worker, scout, and all-around REMF robot. It's lightly armored, and “weapons” are mostly tools, apart from a defensive light photon blaster. 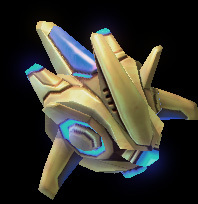 Traits: Protoss Robot; Flight (Low Ceiling, 5 ft; Psionic); Telekinesis 50 (BL 500 lbs. ); Cowardice (9 – unless defending Nexus); No Legs (Aerial). Skills: Brawling-16; Innate Attack-16; Computer Brain loads Expert/Professional skills (at Attribute+2) as needed.